Last week I went to Herefordshire and tasted the best sirloin of Longhorn beef I have ever eaten. This rosy, fleshy slice of succulence was softer than butter yet as flavoursome as rump. Buy direct from the farm and cut out all middle men. It is like getting premier cru wines at cru bourgeois prices. We supply many of the top chefs in the country and private individuals. Huntsham Farm is owned and run by Richard Vaughan and his wife, Rosamund. It specialises in producing the finest rare breed meat from rare pedigree animals – Longhorn beef, Middle White pork and Ryeland lamb – rather than just beef, pork and lamb. 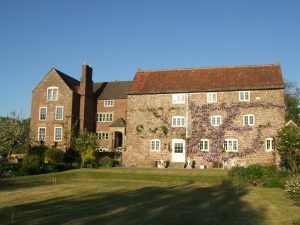 Huntsham Farm is situated in the beautiful Wye Valley and has been in the Vaughan family for nearly four hundred years. Visitors to Huntsham Farm are always welcome to see the very high standards of welfare to which we keep our animals and how they are reared, fed and cared for and to meet the small band of dedicated staff who work on the farm. Meat production in the British Isles has for many years been driven by economic considerations – the requirement to produce animals which grow faster but eat less food – and by an overriding obsession with leanness in meat. The result has been meat which may look good on the sales counter but which is often tough and tasteless. Modern beef is usually bright red, has not been hung for any length of time and has been sourced from any breed of cattle which fits the requirement for cheap, lean meat. Huntsham meat has been produced with superior taste and texture as the primary considerations. It therefore has a higher fat content than most modern meat, which greatly enhances its taste and succulence. Some people like to eat the fat, others don’t, but it is important that the meat is cooked with its fat. Those who don’t like fat should look on it like the sediment in a good bottle of wine – you don’t drink it but it needs to be there. The meat from our animals is sold on an ‘as available’ basis. It is hung until it reaches its ideal maturity and then butchered to meet the requirements of individual customers. Parts of the animal not readily available on supermarket counters, such as pigs’ trotters and beef marrow bones, can be supplied to those who want them.